These individuals were selected based on exemplary public service within their respective communities by a panel of their peers in a 2016 statewide call for nominations. The first three individuals are the winning finalists in separate categories – Director, Superintendent and Public Works Maintenance. 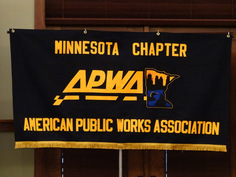 Lee Gustafson was awarded the Hugo G Erickson Award in recognition of his many years of outstanding service to the Minnesota Chapter of the American Public Works Association. Sue Mason, Principal at Short Elliot Hendrickson Inc (SEH) and President of the Minnesota Chapter of the American Public Works Association, noted that public works officials often perform their public service duties quietly and without public recognition. Ms Mason congratulates these outstanding employees and noted that all nominees were highly deserving of the honor. In addition, she applauds the efforts of all public works employees throughout the state, and welcomes the opportunity to give public recognition to those who serve so well.